These fabulous stacking rings are so pretty, you'll love wearing them!! 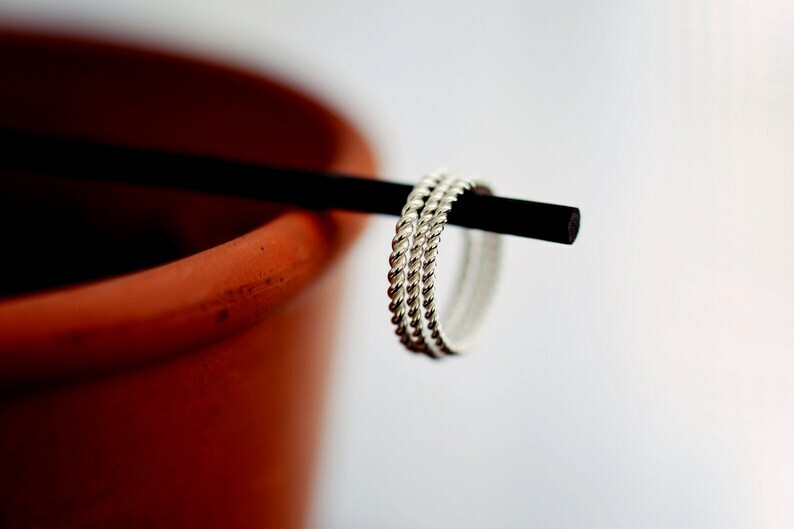 Handmade with pure 925 Sterling Silver, this order is for three (3) Sterling Silver Twist rings. You will receive three rings in either Size 5, 6 or 7... Please click your size at checkout and comment in 'Notes to Seller' size as well... NOTE: ALL 3 Rings will be the SAME SIZE! These Twist rings are the perfect accessory for everyday, you will love the lightweight feel and the twisted silver gives a hint of sparkle. Your Sunshine On Water rings will come wrapped in a gift bag along with a polishing cloth to clean your silver jewelry with.